Is Africa the New Europe? Eurozone ‘Refugees’ Flee to Ex-Colonies! Danger Zone: Northern Europe in Rating Agencies’ Crosshairs! Of all the countries undergoing economic trauma in the eurozone, the one that mystifies us the most is Spain. Not because we at Mediolana are in any sense surprised by the contraction: with a manufacturing base confined to pockets of the north and centre of the nation and a banking sector that is defined by bad real estate loans and other similar toxic assets valued at €176bn, the pricking of a bubble contingent on construction and property was always going to be a messy affair. And while many observers are palpably stunned at an official unemployment rate that the Instituto Nacional de Estadística puts at 22.8% for Q4 2011, Mediolana’s CSO posits that this is only to be expected: even in the boom days, provinces such as Andalusia were notorious for containing little in the way of employment opportunities, seasonal work and entry-level service industry jobs notwithstanding; in a recession, even Spain’s more prosperous areas are characterised by chronic underemployment and unemployment. What perplexes us is not Spain’s plunge into economic freefall, but the reaction to it, particularly from the country’s youth: the rate of unemployment amongst those adults aged 25 or under is now a mesmerising 48%, a colossal increase from the 2006 rate of 17.5%. In the short to medium term, vast swathes of Spanish youth have – to paraphrase one Spanish graduate – been trained for a future that doesn’t exist: their diplomas, degrees and doctorates are effectively worthless in their home country. And while some young Spanish people can and perhaps should find a solution in emigration or entrepreneurship, for many these options may be impractical or unsuccessful. In short, any semblance of an economic future as it has been conventionally understood in much of Europe since 1945 does not presently exist in Spain. The aspect of the reaction that concerns us is not the level of participation in civil society organisations dedicated, at least in part, to addressing this issue: the existence of groups such as ¡Democracia Real YA! 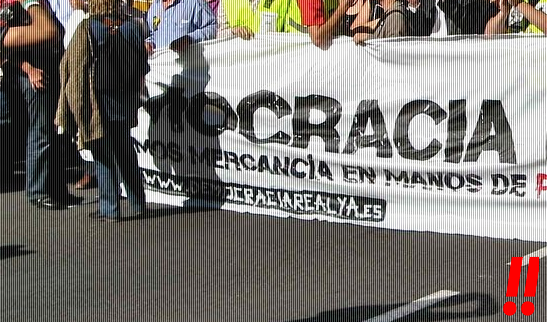 (‘Real Democracy Now!’ or ‘RDY’), a grassroots movement that has drawn millions to protests the length and breadth of Spain, illustrates that there is a genuine realisation in country’s youth that they and the country as a whole is in dire economic straits and that some kind of change is necessary. 1. Capitalism. Capitalism in Spain was severely eroded by credit-based consumerism during the 1990s and 2000s. Now solvent Spanish banks are almost of historical interest only and financial institutions do not even feel comfortable lending money into existence, what is left of the productive economy is fast grinding to a halt. Yet a serious debate about how this situation was permitted to arise and how a culture of savings-based capital formation can be engendered once again does not make the RDY programme. 2. Cultural Modernity. In the last 20 years or so, we at Mediolana have lost count as to how many articles we came across vaunting Spain’s new-found cultural modernity and assimilation of European cultural norms, particularly with regard to the family: the nation’s plummeting birth rate was often cited as an indication of societal maturity. What virtually everyone failed to notice, however, was that the members of the low birth rate generations would be faced with an enormous financial crisis of the state as there are not enough of them to support an ageing population; with the immigrants who propped up the economy during more prosperous times fleeing Spain, the tax base is eroded further and the crisis exacerbated. 3. Botellón. For a number of years in the 2000s, the youth of Spain were principally famous for one thing: the botellón. This practice consisted of drinking significant quantities of alcohol in a public place over a period of four to five hours, before moving on a disco – or causing mayhem in the streets. It sucked up huge amounts of money, administrative effort and law-enforcement resources and was emblematic of the vacuous hedonism which characterised a generation of Spanish youth. The fact that many of these same youth are now wondering whether they will ever experience a regular monthly salary, their own property or any of the normal, really meaningful middle-class accoutrements their parents’ generation took for granted does not appear to have registered with RDY or anyone else.  > Ελλάδα: Apple Inc. Now Worth More Than Greece A.E.